The Calagaz Group began as a photographic supply business run from the garage of Frank and Bea Calagaz in 1949. 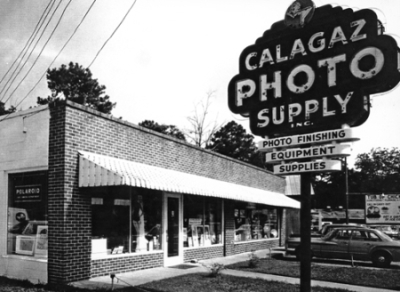 In 1955 they incorporated and opened for business as Calagaz Photo Supply, Inc on Holcombe Avenue, in Mobile, Alabama. It is now being led by 2nd and 3rd generation family members: Frank Calagaz, Chairman of the Board; Leo Calagaz, CEO; Pauline Calagaz McKean, Vice President, FASTSIGNS of Mobile; Joe Calagaz, Vice President, Commercial Printing Division. Calagaz Photo Supply, Inc has grown into The Calagaz Group, which consists of four divisions, Calagaz Photo, Calagaz Printing, Phins Apparel, & FASTSIGNS. The Calagaz Group currently employs 45 people between their divisions. From the sales of glass plates in the very beginning, to the sales of photographic supplies and commercial printing, to the design and development of brand control software, Calagaz has grown over the years from start up to a multi-million dollar firm by continually delivering above and beyond our customers’ expectations. Calagaz Photo, a photography specialty store, offers wide-format posters, die-sublimated personalized promotional items, hardboard mounting, framing and finishing. Calagaz Printing, a commercial print production facility, offers offset, digital, and wide-format printing, die-cutting, book binding, direct mail services, warehousing and fulfillment.